It’s hype time again. Spurred on, no doubt, by the current spate of books and articles about AIED (artificial intelligence in education), the IATEFL Learning Technologies SIG is organising an online event on the topic in November of this year. Currently, the most visible online references to AI in language learning are related to Glossika , basically a language learning system that uses spaced repetition, whose marketing department has realised that references to AI might help sell the product. They’re not alone – see, for example, Knowble which I reviewed earlier this year . In the wider world of education, where AI has made greater inroads than in language teaching, every day brings more stuff: How artificial intelligence is changing teaching , 32 Ways AI is Improving Education , How artificial intelligence could help teachers do a better job , etc., etc. There’s a full-length book by Anthony Seldon, The Fourth Education Revolution: will artificial intelligence liberate or infantilise humanity? (2018, University of Buckingham Press) – one of the most poorly researched and badly edited books on education I’ve ever read, although that won’t stop it selling – and, no surprises here, there’s a Pearson commissioned report called Intelligence Unleashed: An argument for AI in Education (2016) which is available free. Common to all these publications is the claim that AI will radically change education. When it comes to language teaching, a similar claim has been made by Donald Clark (described by Anthony Seldon as an education guru but perhaps best-known to many in ELT for his demolition of Sugata Mitra). In 2017, Clark wrote a blog post for Cambridge English (now unavailable) entitled How AI will reboot language learning, and a more recent version of this post, called AI has and will change language learning forever (sic) is available on Clark’s own blog. Given the history of the failure of education predictions, Clark is making bold claims. Thomas Edison (1922) believed that movies would revolutionize education. Radios were similarly hyped in the 1940s and in the 1960s it was the turn of TV. In the 1980s, Seymour Papert predicted the end of schools – ‘the computer will blow up the school’, he wrote. Twenty years later, we had the interactive possibilities of Web 2.0. As each technology failed to deliver on the hype, a new generation of enthusiasts found something else to make predictions about. But is Donald Clark onto something? Developments in AI and computational linguistics have recently resulted in enormous progress in machine translation. Impressive advances in automatic speech recognition and generation, coupled with the power that can be packed into a handheld device, mean that we can expect some re-evaluation of the value of learning another language. Stephen Heppell, a specialist at Bournemouth University in the use of ICT in Education, has said: ‘Simultaneous translation is coming, making language teachers redundant. Modern languages teaching in future may be more about navigating cultural differences’ (quoted by Seldon, p.263). Well, maybe, but this is not Clark’s main interest. Less a matter of opinion and much closer to the present day is the issue of assessment. AI is becoming ubiquitous in language testing. Cambridge, Pearson, TELC, Babbel and Duolingo are all using or exploring AI in their testing software, and we can expect to see this increase. Current, paper-based systems of testing subject knowledge are, according to Rosemary Luckin and Kristen Weatherby, outdated, ineffective, time-consuming, the cause of great anxiety and can easily be automated (Luckin, R. & Weatherby, K. 2018. ‘Learning analytics, artificial intelligence and the process of assessment’ in Luckin, R. (ed.) Enhancing Learning and Teaching with Technology, 2018. UCL Institute of Education Press, p.253). By capturing data of various kinds throughout a language learner’s course of study and by using AI to analyse learning development, continuous formative assessment becomes possible in ways that were previously unimaginable. ‘Assessment for Learning (AfL)’ or ‘Learning Oriented Assessment (LOA)’ are two terms used by Cambridge English to refer to the potential that AI offers which is described by Luckin (who is also one of the authors of the Pearson paper mentioned earlier). In practical terms, albeit in a still very limited way, this can be seen in the CUP course ‘Empower’, which combines CUP course content with validated LOA from Cambridge Assessment English. Will this reboot or revolutionise language teaching? Probably not and here’s why. AIED systems need to operate with what is called a ‘domain knowledge model’. This specifies what is to be learnt and includes an analysis of the steps that must be taken to reach that learning goal. Some subjects (especially STEM subjects) ‘lend themselves much more readily to having their domains represented in ways that can be automatically reasoned about’ (du Boulay, D. et al., 2018. ‘Artificial intelligences and big data technologies to close the achievement gap’ in Luckin, R. (ed.) Enhancing Learning and Teaching with Technology, 2018. UCL Institute of Education Press, p.258). This is why most AIED systems have been built to teach these areas. Language are rather different. We simply do not have a domain knowledge model, except perhaps for the very lowest levels of language learning (and even that is highly questionable). Language learning is probably not, or not primarily, about acquiring subject knowledge. Debate still rages about the relationship between explicit language knowledge and language competence. AI-driven formative assessment will likely focus most on explicit language knowledge, as does most current language teaching. This will not reboot or revolutionise anything. It will more likely reinforce what is already happening: a model of language learning that assumes there is a strong interface between explicit knowledge and language competence. It is not a model that is shared by most SLA researchers. So, one thing that AI can do (and is doing) for language learning is to improve the algorithms that determine the way that grammar and vocabulary are presented to individual learners in online programs. AI-optimised delivery of ‘English Grammar in Use’ may lead to some learning gains, but they are unlikely to be significant. It is not, in any case, what language learners need. AI, Donald Clark suggests, can offer personalised learning. Precisely what kind of personalised learning this might be, and whether or not this is a good thing, remains unclear. A 2015 report funded by the Gates Foundation found that we currently lack evidence about the effectiveness of personalised learning. We do not know which aspects of personalised learning (learner autonomy, individualised learning pathways and instructional approaches, etc.) or which combinations of these will lead to gains in language learning. The complexity of the issues means that we may never have a satisfactory explanation. You can read my own exploration of the problems of personalised learning starting here . What’s left? Clark suggests that chatbots are one area with ‘huge potential’. I beg to differ and I explained my reasons eighteen months ago . Chatbots work fine in very specific domains. As Clark says, they can be used for ‘controlled practice’, but ‘controlled practice’ means practice of specific language knowledge, the practice of limited conversational routines, for example. It could certainly be useful, but more than that? Taking things a stage further, Clark then suggests more holistic speaking and listening practice with Amazon Echo, Alexa or Google Home. If and when the day comes that we have general, as opposed to domain-specific, AI, chatting with one of these tools would open up vast new possibilities. Unfortunately, general AI does not exist, and until then Alexa and co will remain a poor substitute for human-human interaction (which is readily available online, anyway). Incidentally, AI could be used to form groups of online language learners to carry out communicative tasks – ‘the aim might be to design a grouping of students all at a similar cognitive level and of similar interests, or one where the participants bring different but complementary knowledge and skills’ (Luckin, R., Holmes, W., Griffiths, M. & Forceir, L.B. 2016. Intelligence Unleashed: An argument for AI in Education. London: Pearson, p.26). Predictions about the impact of technology on education have a tendency to be made by people with a vested interest in the technologies. Edison was a businessman who had invested heavily in motion pictures. Donald Clark is an edtech entrepreneur whose company, Wildfire, uses AI in online learning programs. Stephen Heppell is executive chairman of LP+ who are currently developing a Chinese language learning community for 20 million Chinese school students. The reporting of AIED is almost invariably in websites that are paid for, in one way or another, by edtech companies. Predictions need, therefore, to be treated sceptically. Indeed, the safest prediction we can make about hyped educational technologies is that inflated expectations will be followed by disillusionment, before the technology finds a smaller niche. Like the mythical monster, the ancient Hydra organisation of Marvel Comics grows two more heads if one is cut off, becoming more powerful in the process. With the most advanced technology on the planet and with a particular focus on data gathering, Hydra operates through international corporations and highly-placed individuals in national governments. Personalized learning has also been around for centuries. Its present incarnation can be traced to the individualized instructional programmes of the late 19th century which ‘focused on delivering specific subject matter […] based on the principles of scientific management. The intent was to solve the practical problems of the classroom by reducing waste and increasing efficiency, effectiveness, and cost containment in education (Januszewski, 2001: 58). Since then, personalized learning has adopted many different names, including differentiated instruction, individualized instruction, individually guided education, programmed instruction, personalized learning, personalized instruction, and individually prescribed instruction. Disambiguating the terms has never been easy. In the world of language learning / teaching, it was observed back in the early 1970s ‘that there is little agreement on the description and definition of individualized foreign language instruction’ (Garfinkel, 1971: 379). The point was echoed a few years later by Grittner (1975: 323): it ‘means so many things to so many different people’. A UNESCO document (Chaix & O’Neil, 1978: 6) complained that ‘the term ‘individualization’ and the many expressions using the same root, such as ‘individualized learning’, are much too ambiguous’. Zoom forward to the present day and nothing has changed. Critiquing the British government’s focus on personalized learning, the Institute for Public Policy Research (Johnson, 2004: 17) wrote that it ‘remains difficult to be certain what the Government means by personalised learning’. In the U.S. context, a piece by Sean Cavanagh (2014) in Education Week (which is financially supported by the Gates Foundation) noted that although ‘the term “personalized learning” seems to be everywhere, there is not yet a shared understanding of what it means’. In short, as Arthur Levine has put it, the words personalized learning ‘generate more heat than light’. Despite the lack of clarity about what precisely personalized learning actually is, it has been in the limelight of language teaching and learning since before the 1930s when Pendleton (1930: 195) described the idea as being more widespread than ever before. Zoom forward to the 1970s and we find it described as ‘one of the major movements in second-language education at the present time’ (Chastain, 1975: 334). In 1971, it was described as ‘a bandwagon onto which foreign language teachers at all levels are jumping’ (Altman & Politzer, 1971: 6). A little later, in the 1980s, ‘words or phrases such as ‘learner-centered’, ‘student-centered’, ‘personalized’, ‘individualized’, and ‘humanized’ appear as the most frequent modifiers of ‘instruction’ in journals and conferences of foreign language education (Altman & James, 1980). Continue to the present day, and we find that personalized learning is at the centre of the educational policies of governments across the world. Between 2012 and 2015, the U.S. Department of Education threw over half a billion dollars at personalized learning initiatives (Bulger, 2016: 22). At the same time, there is massive sponsorship of personalized learning from the biggest international corporations (the William and Flora Hewlett Foundation, Rogers Family Foundation, Susan and Michael Dell Foundation, and the Eli and Edythe Broad Foundation) (Bulger, 2016: 22). The Bill & Melinda Gates Foundation has invested nearly $175 million in personalized learning development and Facebook’s Mark Zuckerberg is ploughing billions of dollars into it. There has, however, been one constant: the belief that technology can facilitate the process of personalization (whatever that might be). Technology appears to offer the potential to realise the goal of personalized learning. We have come a long way from Sydney Pressey’s attempts in the 1920s to use teaching machines to individualize instruction. At that time, the machines were just one part of the programme (and not the most important). But each new technology has offered a new range of possibilities to be exploited and each new technology, its advocates argue, ‘will solve the problems better than previous efforts’ (Ferster, 2014: xii). With the advent of data-capturing learning technologies, it has now become virtually impossible to separate advocacy of personalized instruction from advocacy of digitalization in education. As the British Department for Education has put it ‘central to personalised learning is schools’ use of data (DfES (2005) White Paper: Higher Standards, Better Schools for All. London, Department for Education and Skills, para 4.50). When the U.S. Department of Education threw half a billion dollars at personalized learning initiatives, the condition was that these projects ‘use collaborative, data-based strategies and 21st century tools to deliver instruction’ (Bulger, 2016: 22). Is it just a coincidence that the primary advocates of personalized learning are either vendors of technology or are very close to them in the higher echelons of Hydra (World Economic Forum, World Bank, IMF, etc.)? ‘Personalized learning’ has ‘almost no descriptive value’: it is ‘a term that sounds good without the inconvenience of having any obviously specific pedagogical meaning’ (Feldstein & Hill, 2016: 30). It evokes positive responses, with its ‘nod towards more student-centered learning […], a move that honors the person learning not just the learning institution’ (Watters, 2014). As such, it is ‘a natural for marketing purposes’ since nobody in their right mind would want unpersonalized or depersonalized learning (Feldstein & Hill, 2016: 25). It’s ‘a slogan that nobody’s going to be against, and everybody’s going to be for. Nobody knows what it means, because it doesn’t mean anything. Its crucial value is that it diverts your attention from a question that does mean something: Do you support our policy?’ (Chomsky, 1997). None of the above is intended to suggest that there might not be goals that come under the ‘personalized learning’ umbrella that are worth working towards. But that’s another story – one I will return to in another post. For the moment, it’s just worth remembering that, in one of the Marvel Comics stories, Captain America, who appeared to be fighting the depersonalized evils of the world, was actually a deep sleeper agent for Hydra. Bulger, M. 2016. Personalized Learning: The Conversations We’re Not Having. New York: Data and Society Research Institute. ELT publishing, international language testing and private language schools are all industries: products are produced, bought and sold for profit. English language teaching (ELT) is not. It is an umbrella term that is used to describe a range of activities, some of which are industries, and some of which (such as English teaching in high schools around the world) might better be described as public services. ELT, like education more generally, is, nevertheless, often referred to as an ‘industry’. The framing of ELT as an industry is both a reflection of how we understand the term and a force that shapes our understanding. Associated with the idea of ‘industry’ is a constellation of other ideas and words (such as efficacy, productivity, privatization, marketization, consumerization, digitalization and globalization) which become a part of ELT once it is framed as an industry. Repeated often enough, ‘ELT as an industry’ can become a metaphor that we think and live by. Those activities that fall under the ELT umbrella, but which are not industries, become associated with the desirability of industrial practices through such discourse. The shift from education, seen as a public service, to educational managerialism (where education is seen in industrial terms with a focus on efficiency, free market competition, privatization and a view of students as customers) can be traced to the 1980s and 1990s (Gewirtz, 2001). In 1999, under pressure from developed economies, the General Agreement on Trade in Services (GATS) transformed education into a commodity that could be traded like any other in the marketplace (Robertson, 2006). The global industrialisation and privatization of education continues to be promoted by transnational organisations (such as the World Bank and the OECD), well-funded free-market think-tanks (such as the Cato Institute), philanthro-capitalist foundations (such as the Gates Foundation) and educational businesses (such as Pearson) (Ball, 2012). Managerialist approaches to education require educational products and services to be measured and compared. In ELT, the most visible manifestation of this requirement is the current ubiquity of learning outcomes. Contemporary coursebooks are full of ‘can-do’ statements, although these are not necessarily of any value to anyone. Examples from one unit of one best-selling course include ‘Now I can understand advice people give about hotels’ and ‘Now I can read an article about unique hotels’ (McCarthy et al. 2014: 74). However, in a world where accountability is paramount, they are deemed indispensable. The problem from a pedagogical perspective is that teaching input does not necessarily equate with learning uptake. Indeed, there is no reason why it should. Drawing on the Common European Framework of Reference for Languages (CEFR) for inspiration, new performance scales have emerged in recent years. These include the Cambridge English Scale and the Pearson Global Scale of English. Moving away from the broad six categories of the CEFR, such scales permit finer-grained measurement and we now see individual vocabulary and grammar items tagged to levels. Whilst such initiatives undoubtedly support measurements of efficacy, the problem from a pedagogical perspective is that they assume that language learning is linear and incremental, as opposed to complex and jagged. Given the importance accorded to the measurement of language learning (or what might pass for language learning), it is unsurprising that attention is shifting towards the measurement of what is probably the most important factor impacting on learning: the teaching. Teacher competency scales have been developed by Cambridge Assessment, the British Council and EAQUALS (Evaluation and Accreditation of Quality Language Services), among others. The backwash effects of the deployment of such scales are yet to be fully experienced, but the likely increase in the perception of both language learning and teacher learning as the synthesis of granularised ‘bits of knowledge’ is cause for concern. Digital technology may offer advantages to both English language teachers and learners, but its rapid growth in language learning is the result, primarily but not exclusively, of the way it has been promoted by those who stand to gain financially. In education, generally, and in English language teaching, more specifically, advocacy of the privatization of education is always accompanied by advocacy of digitalization. The global market for digital English language learning products was reported to be $2.8 billion in 2015 and is predicted to reach $3.8 billion by 2020 (Ambient Insight, 2016). In tandem with the increased interest in measuring learning outcomes, there is fierce competition in the market for high-stakes examinations, and these are increasingly digitally delivered and marked. In the face of this competition and in a climate of digital disruption, companies like Pearson and Cambridge English are developing business models of vertical integration where they can provide and sell everything from placement testing, to courseware (either print or delivered through an LMS), teaching, assessment and teacher training. Huge investments are being made in pursuit of such models. Pearson, for example, recently bought GlobalEnglish, Wall Street English, and set up a partnership with Busuu, thus covering all aspects of language learning from resources provision and publishing to off- and online training delivery. As regards assessment, the most recent adult coursebook from Cambridge University Press (in collaboration with Cambridge English Language Assessment), ‘Empower’ (Doff, et. Al, 2015) sells itself on a combination of course material with integrated, validated assessment. Besides its potential for scalability (and therefore greater profit margins), the appeal (to some) of platform-delivered English language instruction is that it facilitates assessment that is much finer-grained and actionable in real time. Digitization and testing go hand in hand. Few English language teachers have been unaffected by the move towards digital. In the state sectors, large-scale digitization initiatives (such as the distribution of laptops for educational purposes, the installation of interactive whiteboards, the move towards blended models of instruction or the move away from printed coursebooks) are becoming commonplace. In the private sectors, online (or partially online) language schools are taking market share from the traditional bricks-and-mortar institutions. These changes have entailed modifications to the skill-sets that teachers need to have. Two announcements at this conference reflect this shift. First of all, Cambridge English launched their ‘Digital Framework for Teachers’, a matrix of six broad competency areas organised into four levels of proficiency. Secondly, Aqueduto, the Association for Quality Education and Training Online, was launched, setting itself up as an accreditation body for online or blended teacher training courses. In the United States, and likely soon in the UK, the move towards privatization is accompanied by an overt attack on teachers’ unions, rights, pay and conditions (Selwyn, 2014). As English language teaching in both public and private sectors is commodified and marketized it is no surprise to find that the drive to bring down costs has a negative impact on teachers worldwide. Gwynt (2015), for example, catalogues cuts in funding, large-scale redundancies, a narrowing of the curriculum, intensified workloads (including the need to comply with ‘quality control measures’), the deskilling of teachers, dilapidated buildings, minimal resources and low morale in an ESOL department in one British further education college. In France, a large-scale study by Wickham, Cagnol, Wright and Oldmeadow (Linguaid, 2015; Wright, 2016) found that EFL teachers in the very competitive private sector typically had multiple employers, limited or no job security, limited sick pay and holiday pay, very little training and low hourly rates that were deteriorating. One of the principle drivers of the pressure on salaries is the rise of online training delivery through Skype and other online platforms, using offshore teachers in low-cost countries such as the Philippines. This type of training represents 15% in value and up to 25% in volume of all language training in the French corporate sector and is developing fast in emerging countries. These examples are illustrative of a broad global trend. Given the current climate, teachers will benefit from closer networking with fellow professionals in order, not least, to be aware of the rapidly changing landscape. It is likely that they will need to develop and extend their skill sets (especially their online skills and visibility and their specialised knowledge), to differentiate themselves from competitors and to be able to demonstrate that they are in tune with current demands. More generally, it is important to recognise that current trends have yet to run their full course. Conditions for teachers are likely to deteriorate further before they improve. More than ever before, teachers who want to have any kind of influence on the way that marketization and industrialization are shaping their working lives will need to do so collectively. ‘Sticky’ – as in ‘sticky learning’ or ‘sticky content’ (as opposed to ‘sticky fingers’ or a ‘sticky problem’) – is itself fast becoming a sticky word. If you check out ‘sticky learning’ on Google Trends, you’ll see that it suddenly spiked in September 2011, following the slightly earlier appearance of ‘sticky content’. The historical rise in this use of the word coincides with the exponential growth in the number of references to ‘big data’. I am often asked if adaptive learning really will take off as a big thing in language learning. Will adaptivity itself be a sticky idea? When the question is asked, people mean the big data variety of adaptive learning, rather than the much more limited adaptivity of spaced repetition algorithms, which, I think, is firmly here and here to stay. I can’t answer the question with any confidence, but I recently came across a book which suggests a useful way of approaching the question. 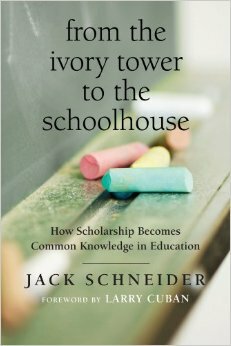 ‘From the Ivory Tower to the Schoolhouse’ by Jack Schneider (Harvard Education Press, 2014) investigates the reasons why promising ideas from education research fail to get taken up by practitioners, and why other, less-than-promising ideas, from a research or theoretical perspective, become sticky quite quickly. As an example of the former, Schneider considers Robert Sternberg’s ‘Triarchic Theory’. As an example of the latter, he devotes a chapter to Howard Gardner’s ‘Multiple Intelligences Theory’. Schneider argues that educational ideas need to possess four key attributes in order for teachers to sit up, take notice and adopt them. To what extent does big data adaptive learning possess these attributes? It certainly comes up trumps with respect to perceived significance. The big question that it attempts to answer is the question of how we can make language learning personalized / differentiated / individualised. As its advocates never cease to remind us, adaptive learning holds out the promise of moving away from a one-size-fits-all approach. The extent to which it can keep this promise is another matter, of course. For it to do so, it will never be enough just to offer different pathways through a digitalised coursebook (or its equivalent). Much, much more content will be needed: at least five or six times the content of a one-size-fits-all coursebook. At the moment, there is little evidence of the necessary investment into content being made (quite the opposite, in fact), but the idea remains powerful nevertheless. When it comes to philosophical compatibility, adaptive learning begins to run into difficulties. Despite the decades of edging towards more communicative approaches in language teaching, research (e.g. the research into English teaching in Turkey described in a previous post), suggests that teachers still see explanation and explication as key functions of their jobs. They believe that they know their students best and they know what is best for them. Big data adaptive learning challenges these beliefs head on. It is no doubt for this reason that companies like Knewton make such a point of claiming that their technology is there to help teachers. But Jose Ferreira doth protest too much, methinks. Platform-delivered adaptive learning is a direct threat to teachers’ professionalism, their salaries and their jobs. Occupational realism is more problematic still. Very, very few language teachers around the world have any experience of truly blended learning, and it’s very difficult to envisage precisely what it is that the teacher should be doing in a classroom. Publishers moving towards larger-scale blended adaptive materials know that this is a big problem, and are actively looking at ways of packaging teacher training / teacher development (with a specific focus on blended contexts) into the learner-facing materials that they sell. But the problem won’t go away. Education ministries have a long history of throwing money at technological ‘solutions’ without thinking about obtaining the necessary buy-in from their employees. It is safe to predict that this is something that is unlikely to change. Moreover, learning how to become a blended teacher is much harder than learning, say, how to make good use of an interactive whiteboard. Since there are as many different blended adaptive approaches as there are different educational contexts, there cannot be (irony of ironies) a one-size-fits-all approach to training teachers to make good use of this software. Finally, how transportable is big data adaptive learning? Not very, is the short answer, and for the same reasons that ‘occupational realism’ is highly problematic. Looking at things through Jack Schneider’s lens, we might be tempted to come to the conclusion that the future for adaptive learning is a rocky path, at best. But Schneider doesn’t take political or economic considerations into account. Sternberg’s ‘Triarchic Theory’ never had the OECD or the Gates Foundation backing it up. It never had millions and millions of dollars of investment behind it. As we know from political elections (and the big data adaptive learning issue is a profoundly political one), big bucks can buy opinions. It may also prove to be the case that the opinions of teachers don’t actually matter much. If the big adaptive bucks can win the educational debate at the highest policy-making levels, teachers will be the first victims of the ‘creative disruption’ that adaptivity promises. If you don’t believe me, just look at what is going on in the U.S. There are causes for concern, but I don’t want to sound too alarmist. Nobody really has a clue whether big data adaptivity will actually work in language learning terms. It remains more of a theory than a research-endorsed practice. And to end on a positive note, regardless of how sticky it proves to be, it might just provide the shot-in-the-arm realisation that language teachers, at their best, are a lot more than competent explainers of grammar or deliverers of gap-fills. In the words of its founder and CEO, self-declared ‘visionary’ Claudio Santori, Bliu Bliu is ‘the only company in the world that teaches languages we don’t even know’. This claim, which was made during a pitch for funding in October 2014, tells us a lot about the Bliu Bliu approach. It assumes that there exists a system by which all languages can be learnt / taught, and the particular features of any given language are not of any great importance. It’s questionable, to say the least, and Santori fails to inspire confidence when he says, in the same pitch, ‘you join Bliu Bliu, you use it, we make something magical, and after a few weeks you can understand the language’. The basic idea behind Bliu Bliu is that a language is learnt by using it (e.g. by reading or listening to texts), but that the texts need to be selected so that you know the great majority of words within them. The technological challenge, therefore, is to find (online) texts that contain the vocabulary that is appropriate for you. After that, Santori explains , ‘you progress, you input more words and you will get more text that you can understand. Hours and hours of conversations you can fully understand and listen. Not just stupid exercise from stupid grammar book. Real conversation. And in all of them you know 100% of the words. […] So basically you will have the same opportunity that a kid has when learning his native language. Listen hours and hours of native language being naturally spoken at you…at a level he/she can understand plus some challenge, everyday some more challenge, until he can pick up words very very fast’ (sic). On entering the site, you are invited to take a test. In this, you are shown a series of words and asked to say if you find them ‘easy’ or ‘difficult’. There were 12 words in total, and each time I clicked ‘easy’. The system then tells you how many words it thinks you know, and offers you one or more words to click on. Here are the words I was presented with and, to the right, the number of words that Bliu Blu thinks I know, after clicking ‘easy’ on the preceding word. Finally, I was asked about my knowledge of other languages. I said that my French was advanced and that my Spanish and German were intermediate. On the basis of this answer, I was now told that Bliu Bliu thinks that I know 11,073 words. Eight of the words in the test are starred in the Macmillan dictionaries, meaning they are within the most frequent 7,500 words in English. Of the other four, skateboard, footballer and tram are very international words. The last, weekday, is a readily understandable compound made up of two extremely high frequency words. How could Bliu Bliu know, with such uncanny precision, that I know 11,073 words from a test like this? I decided to try the test for French. Again, I clicked ‘easy’ for each of the twelve words that was offered. This time, I was offered a very different set of words, with low frequency items like polynôme, toponymie, diaspora, vectoriel (all of which are cognate with English words), along with the rather surprising vichy (which should have had a capital letter, as it is a proper noun). Despite finding all these words easy, I was mortified to be told that I only knew 6546 words in French. I needn’t have bothered with the test, anyway. Irrespective of level, you are offered vocabulary sets of high frequency words. Examples of sets I was offered included [the, be, of, and, to], [way, state, say, world, two], [may, man, hear, said, call] and [life, down, any, show, t]. Bliu Bliu then gives you a series of short texts that include the target words. You can click on any word you don’t know and you are given either a definition or a translation (I opted for French translations). There is no task beyond simply reading these texts. Putting aside for the moment the question of why I was being offered these particular words when my level is advanced, how does the software perform? The vast majority of the texts are short quotes from brainyquote.com, and here is the first problem. Quotes tend to be pithy and often play with words: their comprehensibility is not always a function of the frequency of the words they contain. For the word ‘say’, for example, the texts included the Shakespearean quote It will have blood, they say; blood will have blood. For the word ‘world’, I was offered this line from Alexander Pope: The world forgetting, by the world forgot. Not, perhaps, the best way of learning a couple of very simple, high-frequency words. But this was the least of the problems. The system operates on a word level. It doesn’t recognise phrases or chunks, or even phrasal verbs. So, a word like ‘down’ (in one of the lists above) is presented without consideration of its multiple senses. The first set of sentences I was asked to read for ‘down’ included: I never regretted what I turned down, You get old, you slow down, I’m Creole, and I’m down to earth, I never fall down. I always fight, I like seeing girls throw down and I don’t take criticism lying down. Not exactly the best way of getting to grips with the word ‘down’ if you don’t know it! You may have noticed the inclusion of the word ‘t’ in one of the lists above. Here are the example sentences for practising this word: (1) Knock the ‘t’ off the ‘can’t’, (2) Sometimes reality T.V. can be stressful, (3) Argentina Debt Swap Won’t Avoid Default, (4) OK, I just don’t understand Nethanyahu, (5) Venezuela: Hell on Earth by Walter T Molano and (6) Work will win when wishy washy wishing won t. I paid €7.99 for one month of this! The translation function is equally awful. With high frequency words with multiple meanings, you get a long list of possible translations, but no indication of which one is appropriate for the context you are looking at. With other words, it is sometimes, simply, wrong. For example, in the sentence, Heaven lent you a soul, Earth will lend a grave, the translation for ‘grave’ was only for the homonymous adjective. In the sentence There’s a bright spot in every dark cloud, the translation for ‘spot’ was only for verbs. And the translation for ‘but’ in We love but once, for once only are we perfectly equipped for loving was ‘mais’ (not at all what it means here!). The translation tool couldn’t handle the first ‘for’ in this sentence, either. Bliu Bliu’s claim that Bliu Bliu knows you very well, every single word you know or don’t know is manifest nonsense and reveals a serious lack of understanding about what it means to know a word. However, as you spend more time on the system, a picture of your vocabulary knowledge is certainly built up. The texts that are offered begin to move away from the one-liners from brainyquote.com. As reading (or listening to recorded texts) is the only learning task that is offered, the intrinsic interest of the texts is crucial. Here, again, I was disappointed. Texts that I was offered were sourced from IEEE Spectrum (The World’s Largest Professional Association for the Advancement of Technology), infowars.com (the home of the #1 Internet News Show in the World), Latin America News and Analysis, the Google official blog (Meet 15 Finalists and Science in Action Winner for the 2013 GoogleScience Fair) MLB Trade Rumors (a clearinghouse for relevant, legitimate baseball rumors), and a long text entitled Robert Waldmann: Policy-Relevant Macro Is All in Samuelson and Solow (1960) from a blog called Brad DeLong’s Grasping Reality……with the Neural Network of a Moderately-Intelligent Cephalopod. There is more curated content (selected from a menu which includes sections entitled ‘18+’ and ‘Controversial Jokes’). In these texts, words that the system thinks you won’t know (most of the proper nouns for example) are highlighted. And there is a small library of novels, again, where predicted unknown words are highlighted in pink. These include Dostoyevsky, Kafka, Oscar Wilde, Gogol, Conan Doyle, Joseph Conrad, Oblomov, H.P. Lovecraft, Joyce, and Poe. You can also upload your own texts if you wish. But, by this stage, I’d had enough and I clicked on the button to cancel my subscription. I shouldn’t have been surprised when the system crashed and a message popped up saying the system had encountered an error. 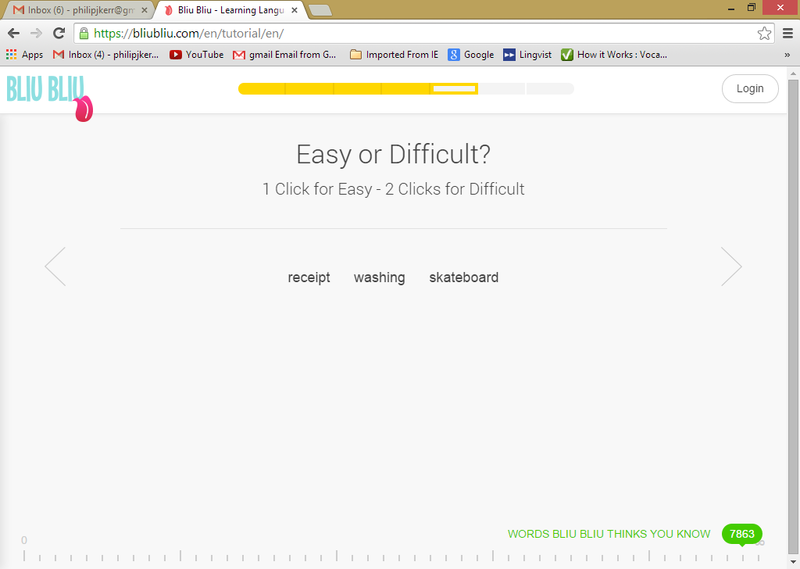 Like so many ‘language learning’ start-ups, Bliu Bliu seems to know a little, but not a lot about language learning. The Bliu Bliu blog has a video of Stephen Krashen talking about comprehensible input (it is misleadingly captioned ‘Stephen Krashen on Bliu Bliu’) in which he says that we all learn languages the same way, and that is when we get comprehensible input in a low anxiety environment. Influential though it has been, Krashen’s hypothesis remains a hypothesis, and it is generally accepted now that comprehensible input may be necessary, but it is not sufficient for language learning to take place. The hypothesis hinges, anyway, on a definition of what is meant by ‘comprehensible’ and no one has come close to defining what precisely this means. Bliu Bliu has falsely assumed that comprehensibility can be determined by self-reporting of word knowledge, and this assumption is made even more problematic by the confusion of words (as sequences of letters) with lexical items. Bliu Bliu takes no account of lexical grammar or collocation (fundamental to any real word knowledge). 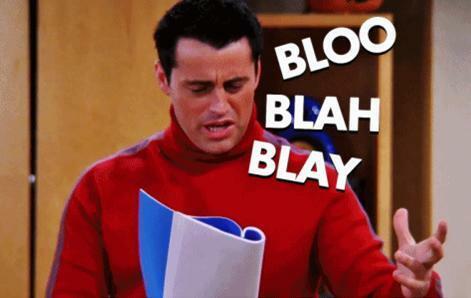 The name ‘Bliu Bliu’ was inspired by an episode from ‘Friends’ where Joey tries and fails to speak French. In the episode, according to the ‘Friends’ wiki, ‘Phoebe helps Joey prepare for an audition by teaching him how to speak French. Joey does not progress well and just speaks gibberish, thinking he’s doing a great job. Phoebe explains to the director in French that Joey is her mentally disabled younger brother so he’ll take pity on Joey.’ Bliu Bliu was an unfortunately apt choice of name. It’s a good time to be in Turkey if you have digital ELT products to sell. Not so good if you happen to be an English language learner. This post takes a look at both sides of the Turkish lira. OUP, probably the most significant of the big ELT publishers in Turkey, recorded ‘an outstanding performance’ in the country in the last financial year, making it their 5th largest ELT market. OUP’s annual report for 2013 – 2014 describes the particularly strong demand for digital products and services, a demand which is now influencing OUP’s global strategy for digital resources. When asked about the future of ELT, Peter Marshall , Managing Director of OUP’s ELT Division, suggested that Turkey was a country that could point us in the direction of an answer to the question. Marshall and OUP will be hoping that OUP’s recently launched Digital Learning Platform (DLP) ‘for the global distribution of adult and secondary ELT materials’ will be an important part of that future, in Turkey and elsewhere. I can’t think of any good reason for doubting their belief. OUP aren’t the only ones eagerly checking the pound-lira exchange rates. For the last year, CUP also reported ‘significant sales successes’ in Turkey in their annual report . For CUP, too, it was a year in which digital development has been ‘a top priority’. 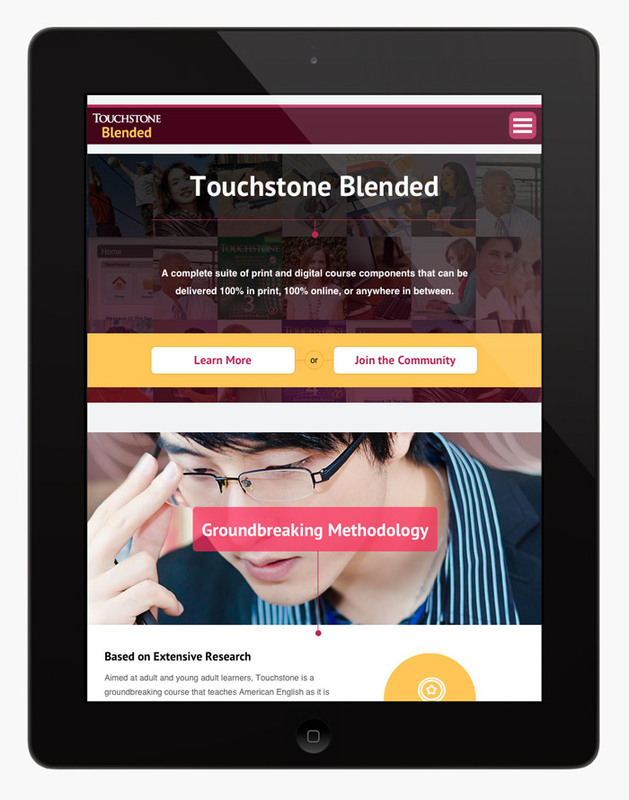 CUP’s Turkish success story has been primarily driven by a deal with Anadolu University (more about this below) to provide ‘a print and online solution to train 1.7 million students’ using their Touchstone course. This was the biggest single sale in CUP’s history and has inspired publishers, both within CUP and outside, to attempt to emulate the deal. The new blended products will, of course, be adaptive. Just how big is the Turkish digital ELT pie? According to a 2014 report from Ambient Insight , revenues from digital ELT products reached $32.0 million in 2013. They are forecast to more than double to $72.6 million in 2018. This is a growth rate of 17.8%, a rate which is practically unbeatable in any large economy, and Turkey is the 17th largest economy in the world, according to World Bank statistics . So, what makes Turkey special? Turkey has a large and young population that is growing by about 1.4% each year, which is equivalent to approximately 1 million people. According to the Turkish Ministry of Education, there are currently about 5.5 million students enrolled in upper-secondary schools. Significant growth in numbers is certain. Turkey is currently in the middle of a government-sponsored $990 million project to increase the level of English proficiency in schools. The government’s target is to position the country as one of the top ten global economies by 2023, the centenary of the Turkish Republic, and it believes that this position will be more reachable if it has a population with the requisite foreign language (i.e. English) skills. As part of this project, the government has begun to introduce English in the 1st grade (previously it was in the 4th grade). The level of English in Turkey is famously low and has been described as a ‘national weakness’. In October/November 2011, the Turkish research institute SETA and the Turkish Ministry for Youth and Sports conducted a large survey across Turkey of 10,174 young citizens, aged 15 to 29. The result was sobering: 59 per cent of the young people said they “did not know any foreign language.” A recent British Council report (2013) found the competence level in English of most (90+%) students across Turkey was evidenced as rudimentary – even after 1000+ hours (estimated at end of Grade 12) of English classes. This is, of course, good news for vendors of English language learning / teaching materials. Purchasing power in Turkey is concentrated in a relatively small number of hands, with the government as the most important player. Institutions are often very large. Anadolu University, for example, is the second largest university in the world, with over 2 million students, most of whom are studying in virtual classrooms. There are two important consequences of this. Firstly, it makes scalable, big-data-driven LMS-delivered courses with adaptive software a more attractive proposition to purchasers. Secondly, it facilitates the B2B sales model that is now preferred by vendors (including the big ELT publishers). Turkey also has a ‘burgeoning private education sector’, according to Peter Marshall, and a thriving English language school industry. According to Ambient ‘commercial English language learning in Turkey is a $400 million industry with over 600 private schools across the country’. Many of these are grouped into large chains (see the bullet point above). Turkey is also ‘in the vanguard of the adoption of educational technology in ELT’, according to Peter Marshall. With 36 million internet users, the 5th largest internet population in Europe, and the 3rd highest online engagement in Europe, measured by time spent online, (reported by Sina Afra ), the country’s enthusiasm for educational technology is not surprising. 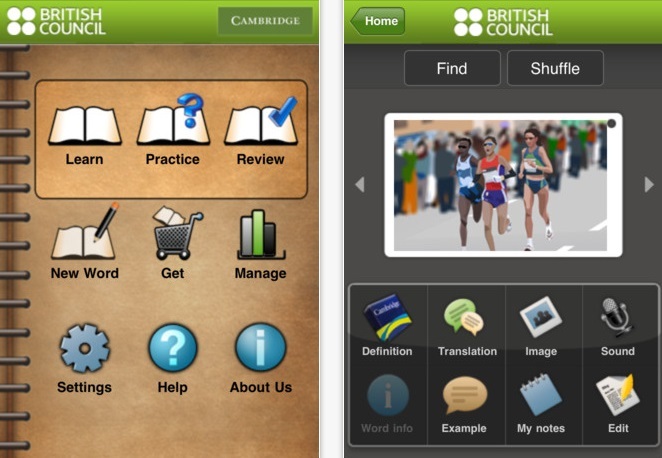 Ambient reports that ‘the growth rate for mobile English educational apps is 27.3%’. This enthusiasm is reflected in Turkey’s thriving ELT conference scene. The most popular conference themes and conference presentations are concerned with edtech. A keynote speech by Esat Uğurlu at the ISTEK schools 3rd international ELT conference at Yeditepe in April 2013 gives a flavour of the current interests. The talk was entitled ‘E-Learning: There is nothing to be afraid of and plenty to discover’. All of the above makes Turkey a good place to be if you’re selling digital ELT products, even though the competition is pretty fierce. If your product isn’t adaptive, personalized and gamified, you may as well not bother. The teaching of English as a subject and not a language of communication was observed in all schools visited. This grammar-based approach was identified as the first of five main factors that, in the opinion of this report, lead to the failure of Turkish students to speak/ understand English on graduation from High School, despite having received an estimated 1000+ hours of classroom instruction. In all classes observed, students fail to learn how to communicate and function independently in English. Instead, the present teacher-centric, classroom practice focuses on students learning how to answer teachers’ questions (where there is only one, textbook-type ‘right’ answer), how to complete written exercises in a textbook, and how to pass a grammar-based test. 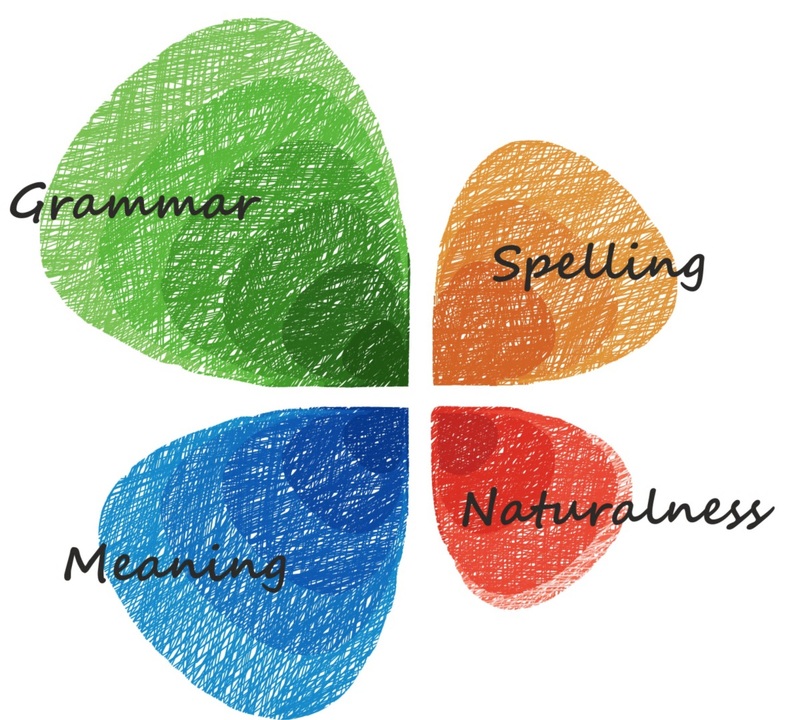 Thus grammar-based exams/grammar tests (with right/wrong answers) drive the teaching and learning process from Grade 4 onwards. This type of classroom practice dominates all English lessons and is presented as the second causal factor with respect to the failure of Turkish students to speak/understand English. The problem, in other words, is the curriculum and the teaching. In its recommendations, the report makes this crystal clear. Priority needs to be given to developing a revised curriculum and ‘a comprehensive and sustainable system of in-service teacher training for English teachers’. Curriculum renewal and programmes of teacher training / development are the necessary prerequisites for the successful implementation of a programme of educational digitalization. Unfortunately, research has shown again and again that these take a long time and outcomes are difficult to predict in advance. By going for digitalization first, Turkey is taking a huge risk. What LMSs, adaptive software and most apps do best is the teaching of language knowledge (grammar and vocabulary), not the provision of opportunities for communicative practice (for which there is currently no shortage of opportunity … it is just that these opportunities are not being taken). There is a real danger, therefore, that the technology will push learning priorities in precisely the opposite direction to that which is needed. Without significant investments in curriculum reform and teacher training, how likely is it that the transmission-oriented culture of English language teaching and learning will change? Even if the money for curriculum reform and teacher training were found, it is also highly unlikely that effective country-wide approaches to blended learning for English would develop before the current generation of tablets and their accompanying content become obsolete. Sadly, the probability is, once more, that educational technology will be a problem-changer, even a problem-magnifier, rather than a problem-solver. I’d love to be wrong. After a break of two years, I recently returned to Duolingo in an attempt to build my German vocabulary. The attempt lasted a week. A few small things had changed, but the essentials had not, and my amusement at translating sentences like The duck eats oranges, A red dog wears white clothes or The fly is important soon turned to boredom and irritation. There are better, free ways of building vocabulary in another language. Whilst little is new in the learning experience of Duolingo, there are significant developments at the company. The first of these is a new funding round in which they raised a further $20 million, bringing total investment to close to $40 million. Duolingo now has more than 25 million users, half of whom are described as ‘active’, and, according to Louis von Ahn, the company’s founder, their ambition is to dominate the language learning market. Approaching their third anniversary, though, Duolingo will need, before long, to turn a profit or, at least, to break even. The original plan, to use the language data generated by users of the site to power a paying translation service, is beginning to bear fruit, with contracts with CNN and BuzzFeed. But Duolingo is going to need other income streams. This may well be part of the reason behind their decision to develop and launch their own test. Duolingo’s marketing people, however, are trying to get another message across: Every year, over 30 million job seekers and students around the world are forced to take a test to prove that they know English in order to apply for a job or school. For some, these tests can cost their family an entire month’s salary. And not only that, taking them typically requires traveling to distant examination facilities and waiting weeks for the results. We believe there should be a better way. This is why today I’m proud to announce the beta release of the Duolingo Test Center, which was created to give everyone equal access to jobs and educational opportunities. 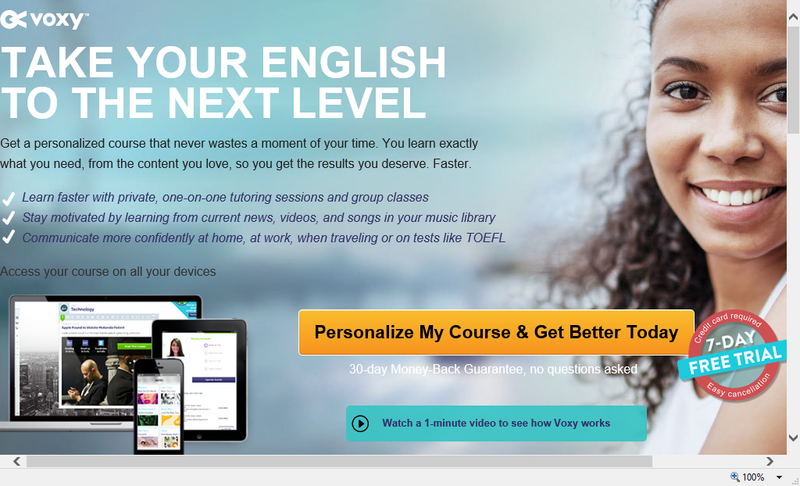 Now anyone can conveniently certify their English skills from home, on their mobile device, and for only $20. That’s 1/10th the cost of existing tests. Talking the creative disruption talk, Duolingo wants to break into the “archaic” industry of language proficiency tests. Basically, then, they want to make the world a better place. I seem to have heard this kind of thing before. The tests will cost $20. Gina Gotthilf , Duolingo’s head of marketing, explains the pricing strategy: We came up with the smallest value that works for us and that a lot of people can pay. Duolingo’s main markets are now the BRICS countries. In China, for example, 1.5 million people signed up with Duolingo in just one week in April of this year, according to @TECHINASIA . Besides China, Duolingo has expanded into India, Japan, Korea, Taiwan, Hong Kong, Vietnam and Indonesia this year. (Brazil already has 2.4 million users, and there are 1.5 million in Mexico.) That’s a lot of potential customers. So, what do you get for your twenty bucks? Not a lot, is the short answer. The test lasts about 18 minutes. There are four sections, and adaptive software analyses the testee’s responses to determine the level of difficulty of subsequent questions. The first section requires users to select real English words from a list which includes invented words. The second is a short dictation, the third is a gapfill, and the fourth is a read-aloud task which is recorded and compared to a native-speaker norm. That’s it. 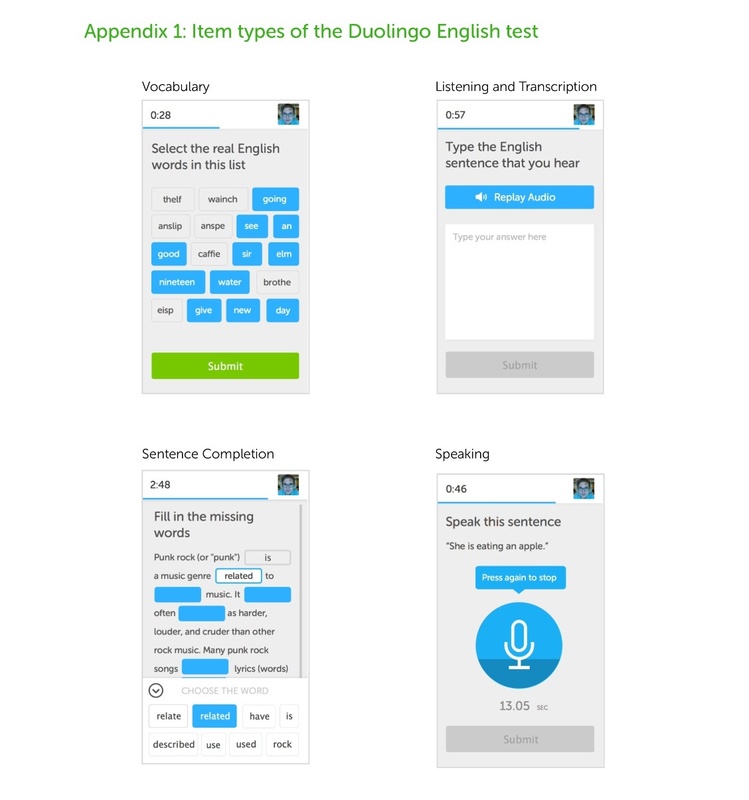 Duolingo claims that the test scores correlate very well with TOEFL, but the claim is based on a single study by a University of Pittsburgh professor that was sponsored by Duolingo. Will further studies replicate the findings? I, for one, wouldn’t bet on it, but I won’t insult your intelligence by explaining my reasons. Test validity and reliability, then, remain to be proved, but even John Lehoczky , interim executive vice president of Carnegie Mellon University (Duolingo was developed by researchers from Carnegie Mellon’s computer science department) acknowledges that at this point [the test] is not a fit vehicle for undergraduate admissions. Even more of a problem than validity and reliability, however, is the question of security. The test is delivered via the web or smartphone apps (Android and iOS). Testees have to provide photo ID and a photo taken on the device they are using. There are various rules (they must be alone, no headphones, etc) and a human proctor reviews the test after it has been completed. This is unlikely to impress authorities like the British immigration authorities, which recently refused to recognise online TOEFL and TOEIC qualifications, after a BBC documentary revealed ‘systematic fraud’ in the taking of these tests. There will always be a market of sorts for valueless qualifications (think, for example, of all the cheap TEFL courses that can be taken online), but to break into the monopoly of TOEFL and IELTS (and soon perhaps Pearson), Duolingo will need to deal with the issues of validity, reliability and security. If they don’t, few – if any – institutions of higher education will recognise the test. But if they do, they’ll need to spend more money: a team of applied linguists with expertise in testing would be a good start, and serious proctoring doesn’t come cheap. Will they be able to do this and keep the price down to $20? ‘Adaptive’ is a buzzword in the marketing of educational products. Chris Dragon, President of Pearson Digital Learning, complained on the Pearson Research blog. that there are so many EdTech providers claiming to be ‘adaptive’ that you have to wonder if they are not using the term too loosely. He talks about semantic satiation, the process whereby ‘temporary loss of meaning [is] experienced when one is exposed to the uninterrupted repetition of a word or phrase’. He then goes on to claim that Pearson’s SuccessMaker (‘educational software that differentiates and personalizes K-8 reading and math instruction’) is the real adaptive McCoy. ‘Adaptive’ is also a buzzword in marketing itself. Google the phrase ‘adaptive marketing’ and you’ll quickly come up with things like Adaptive Marketing Set to Become the Next Big Thing or Adaptive marketing changes the name of the game. Adaptive marketing is what you might expect: the use of big data to track customers and enable ‘marketers to truly tailor their activities in rapid and unparalleled ways to meet their customers’ interests and needs’ (Advertising Age, February 2012). It strikes me that this sets up an extraordinary potential loop: students using adaptive learning software that generates a huge amount of data which could then be used by adaptive marketers to sell other products. I decided it might be interesting to look at the way one adaptive software company markets itself. Knewton, for example, which claims its products are more adaptive than anybody else’s. Knewton clearly spend a lot of time and money on their marketing efforts. There is their blog and a magazine called ‘The Knerd’. There are very regular interviews by senior executives with newspapers, magazines and other blogs. There are very frequent conference presentations. All of these are easily accessible, so it is quite easy to trace Knewton’s marketing message. And even easier when they are so open about it. David Liu, Chief Operating Officer has given an interview in which he outlines his company’s marketing strategy. Knewton, he says, focuses on driving organic interests and traffic. To that end, we have a digital marketing group that’s highly skilled and focused on creating content marketing so users, influencers and partners alike can understand our product, the value we bring and how to work with us. We also use a lot of advanced digital and online lead generation type of techniques to target potential partners and users to be able to get the right people in those discussions. The message consists of four main strands, which I will call EdTech, EduCation, EduBusiness and EdUtopia. Depending on the audience, the marketing message will be adapted, with one or other of these strands given more prominence. Hardly surprisingly, Knewton focuses on what they call their ‘heavy duty infrastructure for an adaptive world’. They are very proud of their adaptive credentials, their ‘rigorous data science’. The basic message is that ‘only Knewton provides true personalization for any student, anywhere’. They are not shy of using technical jargon and providing technical details to prove their point. The key message here is effectiveness (Knewton also uses the term ‘efficacy’). Statistics about growth in pass rates and reduction in withdrawal rates at institutions are cited. At the same time, teachers are directly appealed to with statements like ‘as a teacher, you get tools you never had before’ and ‘teachers will be able to add their own content, upload it, tag it and seamlessly use it’. Accompanying this fairly direct approach is a focus on buzz words and phrases which can be expected to resonate with teachers. Recent blog posts include in their headlines: ‘supporting creativity’, ‘student-centred learning’, ‘peer mentoring’, ‘formative evaluation’, ‘continuous assessment’, ‘learning styles’, ‘scaffolding instruction’, ‘real-world examples’, ‘enrichment’ or ‘lifelong learning’. There is an apparent openness in Knewton’s readiness to communicate with the rest of the world. The blog invites readers to start discussions and post comments. Almost no one does. But one blog post by Jose Ferreira called ‘Rebooting Learning Styles’ provoked a flurry of highly critical and well-informed responses. These remain unanswered. A similar thing happened when David Liu did a guest post at eltjam. A flurry of criticism, but no response. My interpretation of this is that Knewton are a little scared of engaging in debate and of having their marketing message hijacked. an enormous new market of online courses that bring high margin revenue and rapid growth for institutions that start offering them early and declining numbers for those who do not. Because Knewton is trying to disrupt the traditional industry, we have nothing to lose—we’re not cannibalising ourselves—by partnering. Unlike other groups dabbling in adaptive learning, Knewton doesn’t force you to buy pre-fabricated products using our own content. Our platform makes it possible for anyone — publishers, instructors, app developers, and others — to build her own adaptive applications using any content she likes. The data platform industries tend to have a winner-take-all dynamic. You take that and multiply it by a very, very high-stakes product and you get an even more winner-take-all dynamic. We can’t improve education by curing poverty. We have to cure poverty by improving education. Edtech is our best hope to narrow — at scale — the Achievement Gap between rich and poor. Yet, for a time, it will increase that gap. Society must push past that unfortunate moment and use tech-assisted outcome improvements as the rationale to drive spending in poor schools. I started Knewton to do my bit to fix the world’s education system. Education is among the most important problems we face, because it’s the ultimate “gateway” problem. That is, it drives virtually every global problem that we face as a species. But there’s a flip-side: if we can fix education, then we’ll dramatically improve the other problems, too. So in fact, I started Knewton not just to help fix education but to try to fix just about everything. What if the girl who invents the cure for ovarian cancer is growing up in a Cambodian fishing village and otherwise wouldn’t have a chance? As distribution of technology continues to improve, adaptive learning will give her and similar students countless opportunities that they otherwise wouldn’t have. But our ultimate vision – and what really motivated me to start the company – is to solve the access problem for the human race once and for all. Only 22% of the world finishes high school; only 55% finish sixth grade. This is a preventable tragedy. Adaptive learning can give students around the world access to high-quality education they wouldn’t otherwise have. 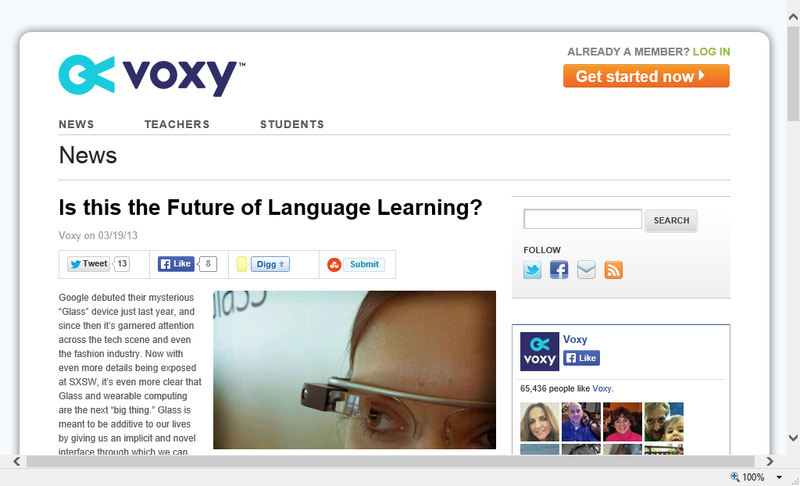 Voxy – ‘the future of language learning’? Voxy uses an integrated web / mobile / SMS platform to deliver its learning programme, which is based around authentic, up-to-date texts. I spent a morning as an advanced learner of English exploring what it had to offer. In what I did, everything was in English, but I imagine this is not the case for lower-level learners. Voxy was originally launched for speakers of Spanish and Portuguese. As far as I could tell, there is very little that is (what I would call) adaptive. There is, no doubt, adaptive software at work in the vocabulary revision exercises, but it’s hard to see this operating. Before starting, users are asked about their level and what they want to ‘accomplish with English’. The six possible answers are ‘advance my career’, ‘enjoy English media’, ‘pass my English tests’, ‘travel abroad’. ‘day-to-day tasks’ and ‘social and lifestyle’. I was next asked about my interests, and the possible answers here were sports, celebrities and entertainment, business, technology, health and politics. Having answered these questions, my personalized course was ready. I was offered a deal of $20 a month, with a free trial. This gave me access to the main course, a faily rudimentary grammar guide, a list of words I had ‘studied’, a proficiency test (reading, listening and TOEFL-style M/C grammar) and 13 hours with a ‘live’ tutor. I decided that I couldn’t pretend to be a real learner and hook up with a tutor. Users can choose a tutor from a menu where the tutors are photographed (obligatory smile). They are young graduates and some, but not all, are described as having ‘Certification: Teaching English’, whatever this means. There are also tutor statements, one of which reads ‘I love that both teaching and studying foreign languages are abound with opportunities to experience international differences and similarities on a personal level’ (sic). I concentrated on the main course which offered 18 lessons related to each of my declared interests. These were based on authentic texts from sources like Financial Times and New York Daily News. These were generally interesting and up-to-date. In some cases, the article was only 24 hours old. 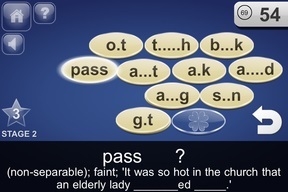 The usual procedure was to (1) read the text, (2) tap on highlighted words, which would bring up dictionary definitions and a recording of the word, (3) listen to a recording of the text (read very slowly – far too slowly for anyone with an advanced level), (4) answer 2 -4 multiple choice questions, (5) be shown short gapped extracts from the text alongside 4 or 5 boxes, which, when you click on them gave a recording of different words, one of which was the correct answer to the highlighted gap in the text, and (6) do a word – definition matching task (the words from stage 5). According to Wikipedia, Voxy is based on the principles of task-based language teaching. Jane Willis might beg to differ. What I saw was closer to those pre-1970s textbooks where texts were followed by glossaries. Voxy is technologically advanced, but methodologically, it is positively antediluvian. No clear rationale in the selection of vocabulary items; no apparent awareness of word difficulty or frequency. No clear rationale in the selection of multiple choice items. Many M/C vocabulary questions can be answered without understanding the word (simply by using the memory). Vocabulary definition matching tasks often contain language in the definitions which is more complex than the target item. The vocabulary definition matching tasks can mostly be done simply by eliminating the distractors (which have been plucked out of thin air, and have not previously appeared). The definitions in these matching tasks often do not use the same grammar as the target item (e.g. an infinitive in the definition has to be matched to a participle target word). Errors (e.g. ‘The brain reacts more strongly to rejection in real life that online rejection’ (sic) in one M/C item). I could go on. The material has clearly not been written by experienced writers, it has not been properly edited or trialled. The texts may be interesting, but that’s the only positive that I can offer for the main part of the course that I looked at. My greatest disappointment concerns the poor use that the technology has been put to. Contrary to Voxy’s claims, this is not a new way to learn a language, it’s not particularly fun and it’s hard to believe that it could be effective. Perhaps my, admittedly limited, experience with Voxy’s product was unrepresentative. Using authentic materials is a good idea, but this needs to be combined with decent social networking possibilities, a much more sophisticated use of adaptive technology, proper investment in item-writers and editors, and more. The future of language learning? Probably not.